If, when drawing a horse, you find yourself positioned behind it, you have not drawn a short straw. The rear of the horse is full of design possibilities. 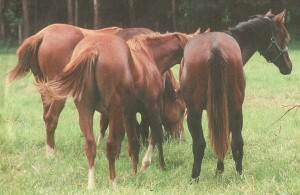 You have the great masses of muscle ready to propel the animal forward and, below, the structure of the bones and tendons of the back legs is easily visible even in a thick-set horse. Look at these powerful compositions, “The Rear View” by Peter. 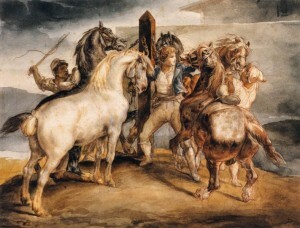 P. Rubens ( below) , and “Horse Market, Five Horses at the Stake” by Theodore Gericault (above). 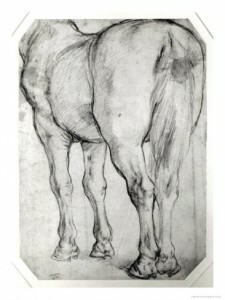 Let’s first consider how to draw the muscular rump of the horse. 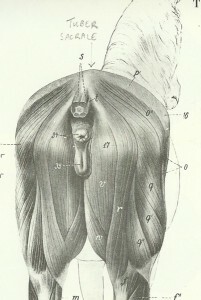 The muscles of the rear end drape over the bones of the pelvis. This gives the rump a recognisable shape with left and right sides mirroring one another. 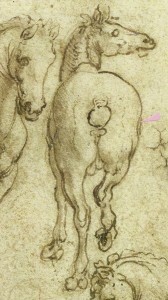 The above drawings show three representations of the rear view of the horse. On the right hand side is the bony skeleton. The middle drawing shows how the muscles fit over the bones. 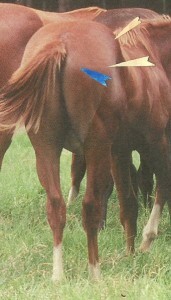 On the left we see the rear of the horse complete with skin. Even in this drawing, it is possible to appreciate the direction and shape of the muscles, and to see how these are attached to or stretched over prominent bones. If not, then you just have to imagine a line in this position. The two sides of the rump should be symmetrical on either side of this line which means, from almost every viewpoint, the artist needs to take special care with foreshortening. I have marked this high point (the tuber sacrale) on the diagram on the left. If you scroll up to the diagram of the 3 horse rear views, you will see it also marked on the skeleton quite far forward where the pelvis attaches to the spine. In the photo on the right, I have marked the position of the tuber sacrale with a cream arrowhead. 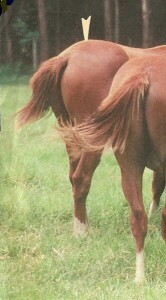 See how the rump slopes down from here back to the base of the tail. 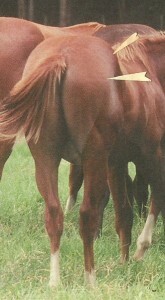 On each side of the horse’s rear, two wide points are the tuber coxae (further forward) and the greater trochanter of the femur (further back). In the photo below, I have used cream arrowheads to mark the positions of the greater trochanters of the femur. This trochanter is simply a knobbly bump on the outside surface of the thigh bone. In the photo, below, I’ve marked the greater trochanter again with a cream arrowhead and, above this in the photo, I’ve marked the tuber coxa with another arrowhead. From some angles, it can help to think of an imaginary line running from the tuber coxa and angling slightly down and back to the greater trochanter. 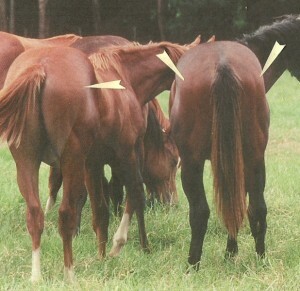 This imagined line marks a change of plane over the horse’s rump. In the next photo, I’ve highlighted the final “landmark” with a blue arrowhead. This is the tuber ischium. There is one of these on either side of the tail, and they just out at the back of the pelvis. These three “landmarks” define the edge of a slab-like surface at the top of the rump. In Gericault’s “Horse Market: Five Horses at the Stake”, below, we see again how the anatomy of the rump has been emphasised. 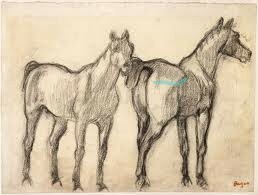 The bony landmarks are quite obvious in the right-hand horse, in which they create an illuminated oblong that is important within the composition. Under the tuber coxa to greater trochanter line, there is a slight concave valley down the side of the thigh. Take a look at this rear view drawing by Leonardo da Vinci, one of his preparatory drawings for the Sforza monument. 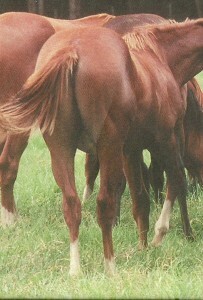 The edges of the rump are shown by a series of elegant curves. My light pink arrowhead points to the concave “valley” down the side of the thigh. 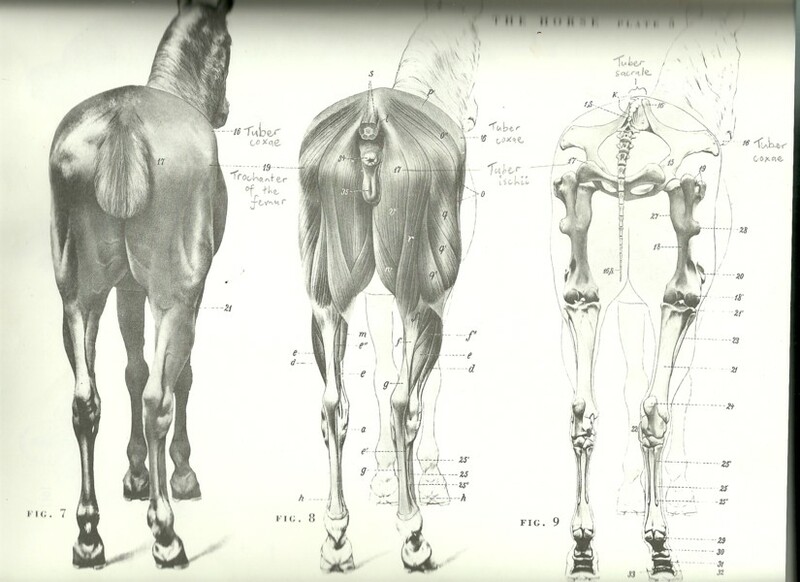 Those of you who come along to the equestrian life drawing day on Sunday should have the chance to lay your hands on the horse and feel where the important bones are positioned, which sections are concave and which are convex. This will help you to understand the structure of what you are seeing. Don’t forget to check back here on Saturday as I shall post some thoughts on drawing the lower parts of the hind limbs.